Located at the 3rd floor of the Sabbagh Library, the Writing/ Research Studio helps students realize their full potential as young writers and researchers. 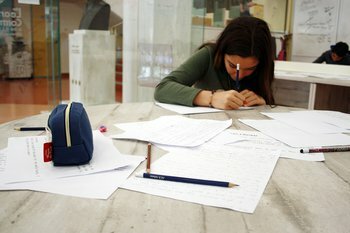 From one-on-one sessions to seminars and workshops, we cover all the different types of writing students have to master throughout Middle and High School: academic essays, research papers, reflections, UCAS personal statements, Common App college essays, motivation letters, CVs as well as various kinds of creative writing (poetry, drama, fiction, film scripts). We firmly believe that writing is always a form of self-exploration, self-expression, and self-definition, further empowering students to become architects of their own learning and leadership identity. Q. Where is the Writing / Research Studio located? The Writing / Research Studio is located at the 3rd floor of the Sabbagh Library. Q. When is Writing / Research Studio open? Monday, Tuesday, Thursday, Friday: 9am-5pm, Wednesday: 9am-4pm. Q. Whom will you find at the Writing / Research Studio? Q. To whom may faculty, students and parents address a question? Q. To which Grades does the Writing /Research Studio offer support? The Writing / Research Studio offers support to all Middle School and Academy students. Q. What services does the Writing / Research Studio offer? Q. When may a student visit the Writing / Research Studio? Q. Do students need to make an appointment to visit the Math/ Science Studio? Yes, especially if there is a need for a one-on-one session.